The exhibition Peter Lanyon: Cornwall Inside Out, at Hazlitt Holland-Hibbert, to accompany the publication of the Peter Lanyon catalogue raisonné by Toby Treves, includes several paintings that retain their original frames. The catalogue also includes notes on Lanyon’s framing practice. Those paintings that are known to retain their original frames date from the post war years and are often simple mouldings made in St Ives by the artist or a local carpenter. 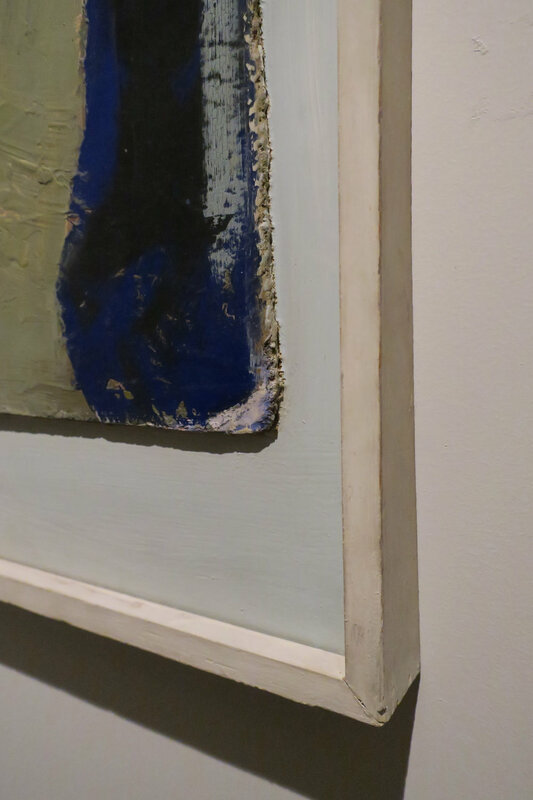 Lanyon’s preference was for a narrow, painted moulding either conventionally gripping the edge of the painting or, as Farm Backs, framing a larger board on which the artwork was ‘floated’. This border was either smooth, as in the case of Albano and Farm Backs, or textured, as Boulder Coast, which was mounted on a board the artist covered in a coarse canvas and painted. Lanyon painted the border after he had nailed the painting to the backing board, as can be seen on Boulder Coast where in places the white paint of the border comes over the edge of the painting. This enabled the artist to choose a colour and tonality that harmonised with the painting. The border of Albano is painted a bluey green and Boulder Coast white. This paler surround contrasts with the darker palette of the painting so emphasising the irregular edges of the board it is painted on. ‘Floating’ the work in this way presents it as an object as well as a painting, an effect Lanyon desired. The frames on Trevalgan and Levant Zawn are a more distinctive frame moulding, characteristic of the period, that grip the edge of the painting. Whilst the inner edge of the frames is painted white, the outer moulding is painted a shade of olive green, in the case of the former, and a grey blue in the latter, although the painting of this frame appears to have been refreshed at a later date. The colour of the frames is, like the borders, chosen to enhance the presentation of the painting. Other paintings, such as Wheal Owles, are not so much framed as edged with a narrow batten of wood, painted white, to conceal the edge of the painting support. We would like to thank Toby Treves for his extensive catalogue raisonné on Peter Lanyon, on which we based this frame note.